Alabama and 13 other states, along with the District of Columbia, joined together to debut the U.S. Civil Rights Trail on Monday, Martin Luther King Jr. Day. Stretching from the Topeka, Kan. schools known for the Brown v. Board of Education case against school segregation in 1954 to the Lincoln Memorial in Washington, D.C. where thousands rallied in 1963., the Civil Rights Trail is a tourism website and campaign that highlights more than 130 historic sites — museums, churches, courthouses and other civil rights landmarks — linked to the modern civil rights movement. Visitors can explore the website through its interactive map, search by state or experience the movement by selecting from a number of civil rights topics. The website also features a timeline of significant dates and a photo gallery. Nearly 30 sites in eight Alabama cities are included in the trail. Ten in Montgomery, seven in Selma, and four in both Birmingham and Tuskegee. Tuscaloosa, Scottsboro, Monroeville and Anniston each have one. Gov. Kay Ivey made the official announcement of the Civil Rights trail on MLK Day at King’s former church. “There’s a lot to see and it’s impossible for somebody to see and do it all in one trip so the goal is to encourage people to cross state lines and to see other parts of the south that they haven’t seen before,” said Lee Sentell, Alabama’s tourism director. 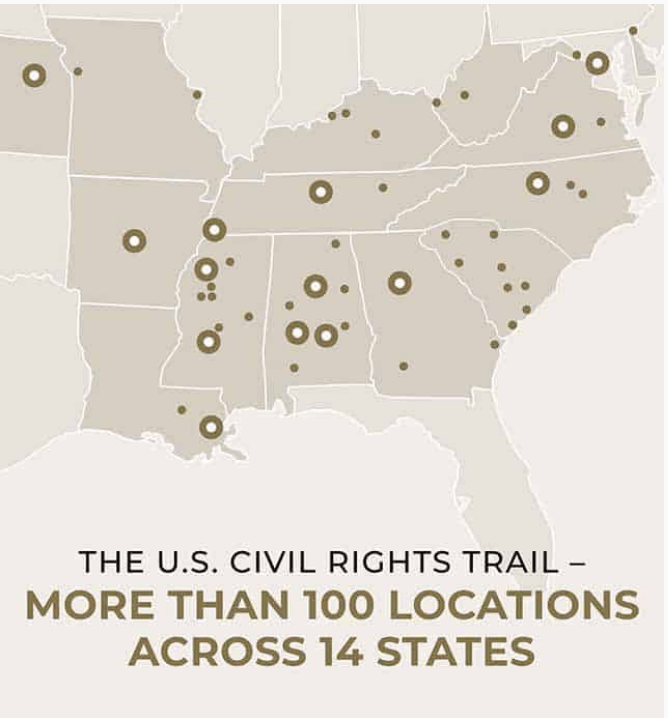 Individual Southern states have promoted civil rights tourist destinations for year, according to Sentell this is the first time states have banded together in a single push to bolster civil rights tourism.